Home to more than 10,000 lakes, including the magnificent Lake Superior, the largest of the Great Lakes and Lake Itasca, the Mississippi River’s primary source, Minnesota boasts some spectacular natural landscapes. Resting on the border between the U.S. and Canada, the state offers an array of attractions, activities, and sights to enjoy, such as the ‘Twin Cities’ of Minneapolis and state capital St. Paul, which are packed with a variety of cultural landmarks to explore. The North Star State, also known as the Land of 10,000 Lakes, also has a wealth of fantastic places to stay and here are some of them. Overlooking the tranquil waters of Gull Lake, the Grand View Lodge Golf Resort & Spa is a posh, year-round golf resort situated 16 miles from downtown Brainerd in Nisswa that provides golf lovers with an idyllic getaway. Home to two championship golf courses, a full-service spa, and an indoor swimming pool, the resorts cater for both golfers and their families. Additional amenities include eight restaurants, a cozy lounge with plush leather sofas and a large stone fireplace for relaxing; and a sandy beach for swimming and sunbathing. Guest rooms have warm, earth-toned décor and furnishings with sitting areas and balconies overlooking the golf courses, while rustic-chic cabins have multiple bedrooms and fully equipped kitchens, and golf villas have private games rooms and added levels of luxury. 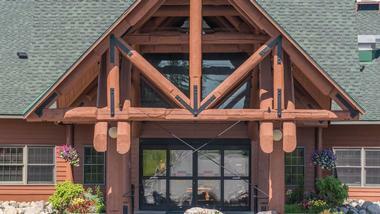 Located in the scenic wilderness of northern Minnesota with panoramic views of Shagawa Lake, the Grand Ely Lodge Resort & Conference Center is a four-season resort and conference venue that offers comfortable accommodations, upscale services and amenities, award-winning cuisine and functional event spaces. Ideal for family vacations or business retreats, the resort features spacious accommodations with private bathrooms and lovely views, a range of facilities, including an indoor swimming pool, whirlpool and sauna, an on-site games room and two restaurants. The hotel also features a modern conference center with function spaces, experienced onsite staff and custom catering services for special occasions and events. Located on the shores of Shagawa Lake, Grand Ely Lodge offers an array of seasonal and outdoor activities for the whole family to enjoy, including kayaking, canoeing, paddle-boating, hiking, biking and more. The restaurants, shops and other attractions of Downtown Ely are just a short walk away from the resort. 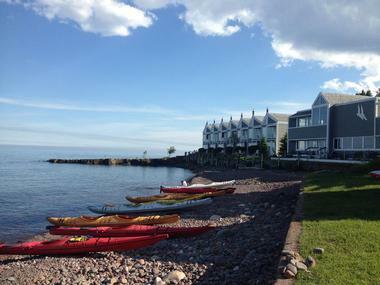 Situated just off Interstate 35 in Duluth, Beacon Pointe Resort is a comfortable beach-house-style property overlooking Lake Superior with casual accommodations in a variety of options, delicious home-cooked cuisine, and an array of facilities. 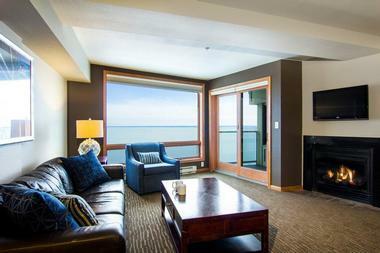 A short walk from the 2.7-mile Lake Walk, and the Duluth Entertainment Convention Center, the resort features airy, laid-back rooms with private balconies and beautiful lake views, fully equipped kitchenettes with coffeemakers and modern amenities. Upgraded suites, penthouses and two- to four-bedroom condos offers extra space for families and groups of friends with full kitchens and living areas with fireplaces, sofas and deluxe Jacuzzis. A complimentary continental breakfast is served every morning, and there are loaner bikes for exploring, as well as a swimming pool, sauna, and fitness center. 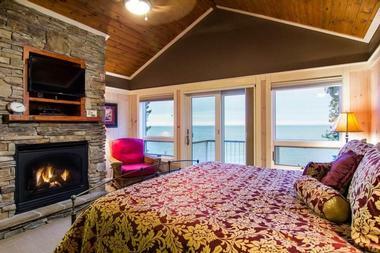 Boasting breathtaking views of Lake Superior, Bluefin Bay on Lake Superior is a charming, rustic resort that lies just one mile from the Temperance River State Park and a short drive from the Lutsen Mountains Ski Resort. The resort features plush, well-appointed guest rooms and one- to three-bedroom apartments with full kitchens, spacious living areas with fireplaces and fireplaces, and en-suite bathrooms with Jacuzzis. Guest rooms and apartments have flat-screen televisions with cable channels and complimentary wireless Internet, and facilities at the resort include a restaurant serving regional cuisine, a relaxed bistro and a deli-style café offering lighter meals and freshly brewed coffee. Other amenities include an indoor swimming pool and a heated outdoor pool, a sauna and a luxury spa, and a private beach is equipped with fire pits for alfresco nights beneath the stars. 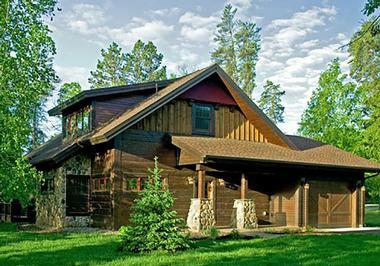 Surrounded by dense woodlands dotted with nature trails, Body Lodge is a rustic mountain lodge–style retreat in Crosslake with easy access to the Whitefish chain of lakes. 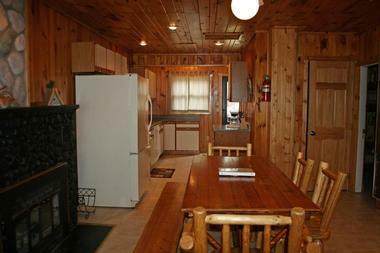 The low-key, year-round resort features casual, air-conditioned cabins and cottages with fully equipped kitchens with dishwashers, living spaces with fireplaces, screened-in porches with beautiful forest views, and modern amenities such as flat-screen televisions with cable channels and complimentary wireless Internet. Guests have use of canoes and kayaks to enjoy on the lake and the free use of a boat landing, as well as resort facilities such as a heated outdoor swimming pool and sauna, a private sandy beach, a children’s playground, and movie nights. Overlooking Pelican Lake in Breezy Point, the eponymously named resort is a laid-back retreat with charming, country-style accommodations, several dining options, and modern facilities in a beautiful setting. 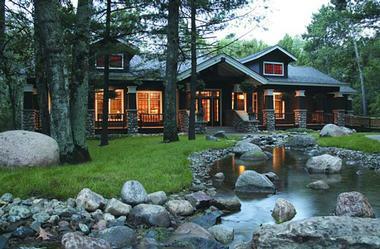 Located 20 miles from downtown Brainerd, the Breezy Point Resort features well-appointed guest rooms with pine furniture, private balconies and modern amenities such as flat-screen televisions with cable channels, microwaves, mini-fridges and coffeemakers, and rustic one-and two-bedroom log cabins with fully equipped kitchens and living rooms. The resort boasts a variety of guest amenities including an indoor swimming pool, tennis courts, games room, private marina, and a golf course, as well as a private island with a beautiful beach and several restaurants, ranging from low-key pizzeria to an elegant seafood restaurant and grill. Located in the Root River Valley surrounded by 30 acres of pristine woodland, Cedar Valley Resort is a charming riverside resort with cozy log cabin-style accommodations and private picnic areas with fire pits and grills. Situated near Lanesboro in Minnesota, the mountain resort offers an array of recreational facilities and activities, including three playgrounds, a nine-hole frisbee golf course, and basketball and volleyball courts. Canoes, bikes and cross-country skis can be rented for an additional fee, guests can enjoy in-room massages and other spa services, and nature-lovers will love the abundant wildlife around the resort. Cedar Valley Resort lies along the 60-mile Root River State Bike Trail and is a few miles from downtown Lanesboro. 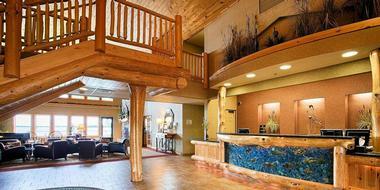 Nestled on the shores of Leech Lake, in the heart of downtown Walker, Chase on the Lake is a chic resort in a stately building with easy access to the Chippewa National Forest and the Northern Lights Casino. The resort features bright guest rooms with private balconies and beautiful lake views, as well as suites and lakeside condos with living and dining areas, and fully equipped kitchens. Modern amenities include flat-screen televisions with cable channels, microwaves, mini-fridges and coffeemakers, and complimentary wireless Internet. Upmarket facilities include a luxury spa, indoor swimming pool and hot tub, a bowling alley, and an inviting restaurant and bar with outdoor patio seating and regular live music. Seasonal activities range from boating, fishing, hiking, and biking to snowmobiling and cross-country skiing. 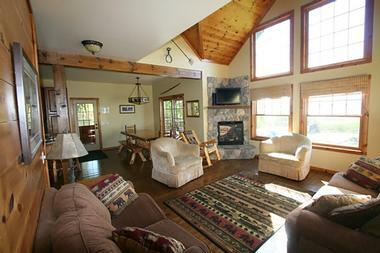 Epitomizing the ‘cozy cabin on a scenic lake’ ideal, Eagle Nest Lodge provides just that and more. 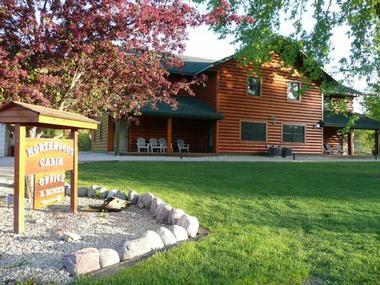 The family-friendly resort in the Chippewa National Forest offers an idyllic spot for relaxing and enjoying time with family and friends with comfortable accommodations and an array of amenities. The resort features 14 clean and comfortable cabins with multiple bedrooms, private bathrooms, ample living areas, and lovely lake views. Amenities at the resort include a 600-foot natural sand beach with beach chairs and loungers, and a safe swimming area with bongo rafts, kayaks, hydro-bikes, paddle boards, canoes and a small sailboat. The lake offers world-class fishing, and other activities range from hiking, mountain biking, wildlife watching, volleyball, and more. Situated just two miles from Lake Superior in Lutsen and a short drive from the beautiful waterfalls and hiking trails at the Cascade River State Park Recreation Site, the Eagle Ridge Resort at Lutsen is a rustic resort with comfortable accommodation and an array of facilities. 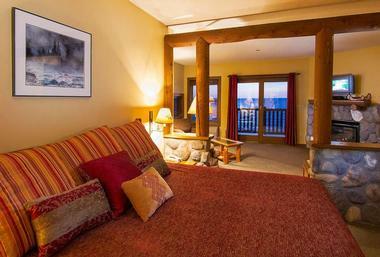 The resort features cabin-style rooms with log furniture cozy fireplaces, and glorious mountain views, as well as ski-in/ski-out condos with one to three bedrooms with en-suite bathrooms, kitchens, and Jacuzzis. Modern amenities include flat-screen televisions with cable channels, microwaves, mini-fridges, and complimentary wireless Internet, and facilities range from an indoor/outdoor swimming pool. 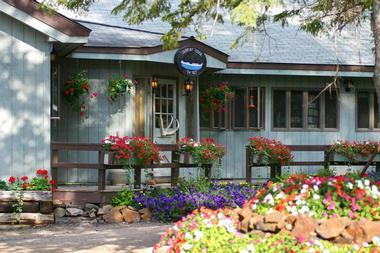 Hot tub and sauna, a tavern providing pub fare and live music, free canoe tours and shuttles to nearby hiking trails. Fair Hills Resort is a charming family-owned and operated seasonal resort that has been providing a tranquil getaway for more than 90 years. Set on the shores of Pelican Lake in the Detroit Lakes region, the rustic resort offers simple cabin-style accommodations with private bathrooms, comfortable furnishings, and fully equipped kitchens. Boasting breathtaking views of the forested and mountain landscapes surrounding the resort, the serene retreat offers a variety of amenities enjoy, from an outdoor swimming pool and hot tub to a nine-hole golf course, indoor and outdoor games, an array of water-based sports, and a casual restaurant. The Good Ol’ Days Family Resort is a rustic, year-round resort on Lower Cullen Lake that offers a fun and relaxing retreat for the whole family. Located less than a mile from downtown Nisswa and six miles from Fritz Loven Park, the resort features modern lodge rooms with Mission-style furnishings, kitchenettes, and patios, as well as two and three-bedroom cottages with full kitchens and living rooms with stone fireplaces. Modern amenities include flat-screen televisions with cable channels, microwaves, mini-fridges, and complimentary wireless Internet. The resort is home to a protected swimming beach with a boat dock and a fish cleaning station, along with an indoor swimming pool, hot tub, sauna, and fitness room, volleyball and basketball courts, a fire pit, grills and picnic tables, and a children’s playground. Set on the shores of Lake Superior, the Grand Superior Lodge is a rustic retreat with inviting accommodations, New Age American cuisine, an array of modern amenities, and gracious hospitality. Located a few miles from the Gooseberry Falls State Park, the charming resort offers guest rooms and cabins with woodsy décor, spacious living areas, sofa beds and fireplaces-suite bathrooms with whirlpool tubs, and balconies with beautiful lake views. Cabins have kitchens for self-catering, and there are several houses available for families and groups of friends, and modern amenities include flat-screen televisions with cable channels, microwaves, mini-fridges, coffeemakers, and complimentary wireless Internet. A casual restaurant serves American cuisine and facilities range from a heated indoor swimming pool with stunning lake views, a sauna, and an exercise room to a 12-person hot tub and a variety of activities such as hiking and biking trails, and kayaking tours. Located on Gunflint Lake, on the border of Ontario, Gunflint Lodge is one of the oldest and the best-known lodges on the Gunflint Trail in Minnesota. Nestled in the dense boreal forest on the south shore of Gunflint Lake between the Lake Superior National Forest and the Boundary Waters Canoe Area Wilderness, 70 km up the Gunflint Trail from Grand Marais, the wilderness resort is open year round and offers an array of comfortable accommodations and outdoor activities. Lakeside cabins have comfortable bedrooms furnished with queen and king sized beds, living rooms with stone fireplaces, and full kitchens, and some have indoor or outdoor spa tubs and saunas. Justine's restaurant serves globally-inspired cuisine on an outdoor patio against a backdrop of Gunflint Lake views, and activities include canoes, kayaks and paddle boards, hiking trails and guided Naturalist activities. 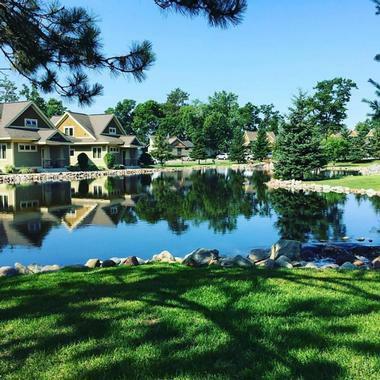 Surrounded by pristine woodlands overlooking Sylvan Lake, Kavanaugh's Sylvan Lake Resort is a beautiful lake resort located just 12 miles from downtown Brainerd that offers a tranquil escape from the hustle and bustle of the big city. The laid-back resort features rustic one- to three-bedroom condos and cottages with comfortable décor and furnishings, living rooms with fireplaces, fully equipped kitchens and gorgeous views of the lake or swimming pool. Resort amenities include indoor and outdoor swimming pools, a hot tub and private beaches, along with a variety of sports such as tennis, basketball, and volleyball, hiking and biking trails, and a children’s playground. 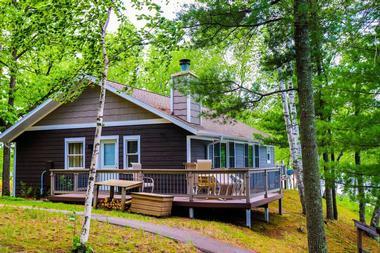 Boasting beautiful views of Lake Superior from its shoreline location and surrounded by vast tracts of rugged wilderness, Larsmont Cottages on Lake Superior promise a unique and unforgettable getaway. 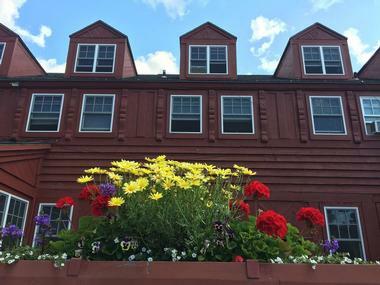 Located a short drive from the from Two Harbors Lighthouse and Gooseberry Falls State Park, the upscale resort offers simple but comfortably furnished guest rooms and suites with en-suite bathrooms and whirlpool tubs, kitchenettes, and living rooms with fireplaces. Rustic-chic cottages have multiple bedrooms for larger groups, along with fully equipped kitchens, and porches with lovely lake views. Modern amenities include flat-screen televisions with cable channels and DVD players and complimentary wireless Internet, and resort facilities range from an exclusive spa and sauna, an indoor swimming pool with a hot tub, and a private beach with fire pits to refined restaurant and grill with a wood-burning oven and seasonal terrace that serves delicious regional fare and loaner bikes for exploring the area. 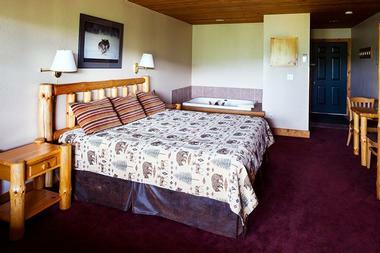 Established in 1946, Lost Lake Lodge is a remote, 80-acre resort situated on both Upper Gull Lake and Lost Lake. The rustic resort features one-to three-bedroom cabins and cottages with woodsy décor, comfortable bedrooms with en-suite bathrooms, spacious living areas with Murphy beds or pull-out sofas and wood-burning fireplaces, full kitchens or kitchenettes, and private docks for boats. A seasonal restaurant serves locally sourced organic fare for breakfast, lunch, and dinner, and resort amenities include boat and bike hire, fishing and beach equipment, indoor and outdoor games, hiking trails, beach with nightly campfires, and a camp for children in the summer. Located on a private island on Lake Vermilion and surrounded by dense forests of fragrant pine trees, Ludlow’s Island Resort is an upscale, family-run resort a short drive from downtown Cook. 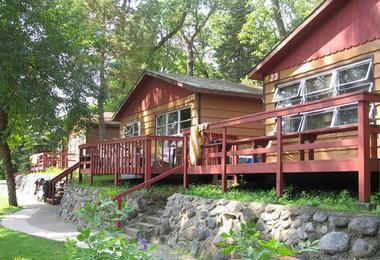 The Minnesota resort features individually decorated, woodsy-chic air-conditioned cabins and cottages with unique décor, fully equipped kitchens, living rooms with fireplaces, and decks or screened-in porches with spectacular lake views. A luxury spa offers salon treatments and massages, and a fitness center, tennis and racquetball courts provide great ways to keep fit, while other amenities include a swimming beach with docks and loaner watercraft and a coin-operated laundry. A free shuttle to the mainland is available to guests, and the Wilderness Golf Course is a 40-minute drive away. Set on a wooded hill overlooking Lake Superior, Lutsen Resort on Lake Superior is a country-chic resort a few miles from downtown Lutsen and a short walk from the Lutsen Mountains trail. The resort’s main building is a Scandinavian-style lodge that houses cozy guest rooms with pine interiors, modern log cabins with fully equipped kitchens and private decks with lovely views, and upscale villas and condos with luxury Jacuzzis. Guests staying at the resort can enjoy an indoor swimming pool, a wellness center, a nine-hole golf course, and a private beach, as well as a casual restaurant that serves traditional North Shore cuisine, and a vibrant pub with light meals and libations. Complimentary shuttles are available to various hiking spots along the trail, and the resort hosts seasonal weekend concerts. Built in the 1920s, Madden’s on Gull Lake is an upscale seasonal golf resort with beautiful lake views and three championship golf courses. Located a short way from the Pillsbury State Forest, the resort features unpretentious guest rooms with modern décor and comfortable furnishings, coffeemakers, mini fridges, wet bars, and flat-screen televisions, and sitting or dining areas. Carved through the north woods of Brainerd, Madden’s on Gull Lake golf courses are recognized among the top golf destinations in the United States and provide players with challenging shots and breathtaking views. Seven dining options at the resort include an elegant lakeside restaurant and a casual, family-friendly pizzeria, and upscale amenities include indoor and outdoor swimming pools, hot tubs and saunas, a luxury spa and tennis courts, a private marina, and three beaches. Resting in the shores of Kabetogama Lake in the Voyageurs National Park, the Northern Lights Resort & Outfitting is a woodsy resort with 12 individually designed rustic cabins and an array of modern amenities. Located just over 30 miles from the Canadian border and International Falls, the resort features well-appointed cabins with multiple bedrooms, en-suite bathrooms, full kitchens, and comfortable living areas with pull-out sofa beds. 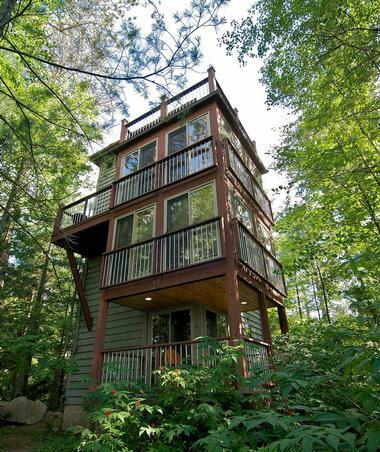 Some cabins have hot tubs and fireplaces, and all have private decks with stunning lake views. The resort boasts a safe swimming area in the lake, paddle boats and boat rentals, and fishing, as well as a variety of activities such as beach volleyball, frisbee golf, hiking and mountain biking, and a games room. 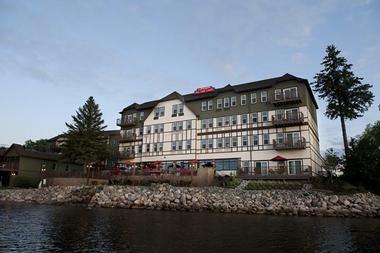 Overlooking the Harbor Cove Marina from the site of the 1900’s Duluth Boat Club, which is set on a seven-mile finger peninsula on Lake Superior, the Park Point Marina Inn is a charming waterside retreat with comfortable accommodations, gourmet cuisine, and upscale amenities. 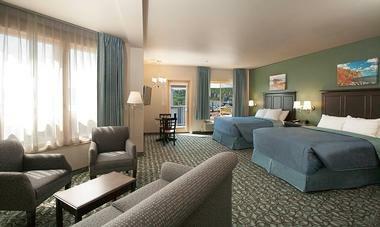 Located a few miles from the Enger Park Golf Course and the Duluth Entertainment Convention Center, the inn features well-appointed guest rooms and suites with en-suite bathrooms and Jacuzzis, living rooms with fireplaces, modern amenities such as flat-screen televisions with cable channels, coffeemakers, microwaves, and mini-fridges, and patio decks with stunning views. A complimentary breakfast buffet is served every morning, and amenities include an indoor swimming pool, hot tubs, a sauna and fitness room, as well as a lounge with a fireplace and a full-service bar. 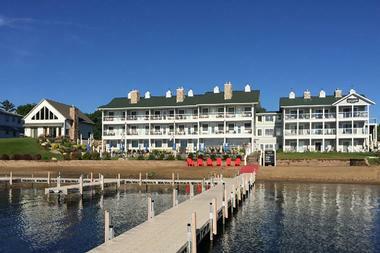 Located in the vast lake-packed region of Nisswa on the shores of Gull Lake, the Quarterdeck Resort is a year-round family destination set on 27 acres of land and 850 feet of beachfront shoreline along the lake. A two-hour drive north of the Twin Cities, the resort balances comfortable accommodations with upmarket amenities and a warm and welcoming ambiance to provide an inviting retreat. Jake’s Beach Grill lakeside offers an unforgettable dining experience and rentable pontoons, kayaks and canoes are ideal for exploring the Gull Lake chain 10,000 acres. Accommodation is available in classic lodge guest rooms and cozy two and three-bedroom cabins with fully equipped kitchens, living rooms with fireplaces, bathrooms with whirlpool tubs, and modern amenities such as flat-screen televisions with cable channels, and complimentary wireless Internet. Other amenities include a sandy swimming beach, basketball and tennis courts, and a casual eatery that serves a complimentary continental breakfast. The Best Western Premier The Lodge on Lake Detroit is a modern, family-friendly lakefront hotel that features well-appointed and warmly decorated guest rooms and suites, casual cuisine, and plenty of amenities for the whole family to enjoy. Guest rooms have comfortable décor and furnishings, en-suite bathrooms, and in-room conveniences such as flat-screen televisions with cable channels, coffeemakers, microwaves, wet bars, and mini-fridges, and upgraded suites have separate living areas with pull-out sofas, full kitchens, and private balconies or patios with glorious views. Deluxe facilities at the resort include a complimentary hot breakfast buffet, an indoor swimming pool and spa, and a fully-equipped fitness center, along with a casual bar and bistro serving casual American fare, and a modern business center with event spaces. Established in 1932 and surrounded by seven acres of pristine woodlands overlooking Blackduck Lake, the White Birch Resort is a welcoming year-round resort a few miles from downtown Blackduck that offers a family-friendly vacation getaway. The resort is home to well-appointed cabins and cottages with two or three-bedrooms, full kitchens with dishwashers, and kitchenettes, as well as flat-screen televisions with cable channels, and complimentary wireless Internet. The resort boasts 2600 acres of four season's recreational adventures for all ages, ranging from floating trampolines on the lake, basketball courts, and a games room to hiking, mountain biking, fishing, swimming, and boating on the lake.